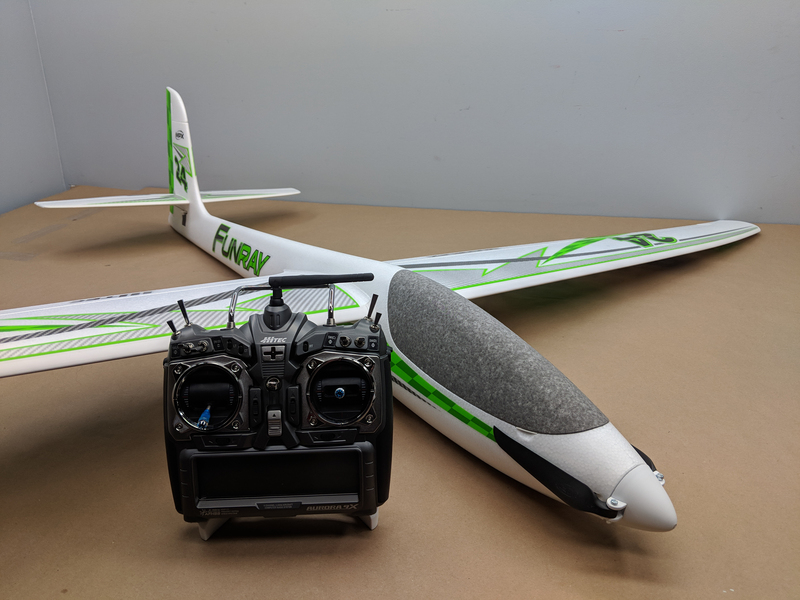 So here I am, sitting at my computer writing about another assembled airplane that I haven’t been able to fly yet, and I have one HUGE question as we’re in the middle of yet another snow storm…. WILL IT EVER STOP SNOWING IN MINNESOTA?!?!? 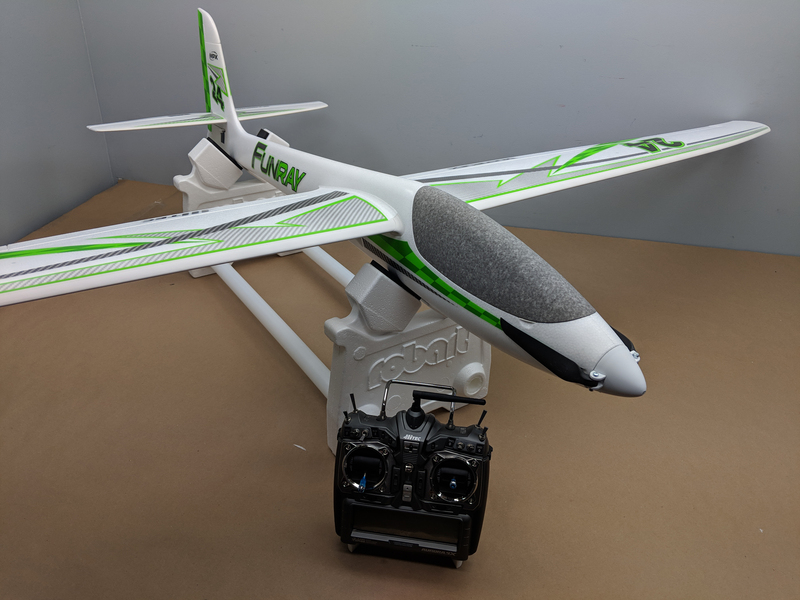 Whilst I wait, I figured that I can, again, split the review into two parts – Assembly and Flying. 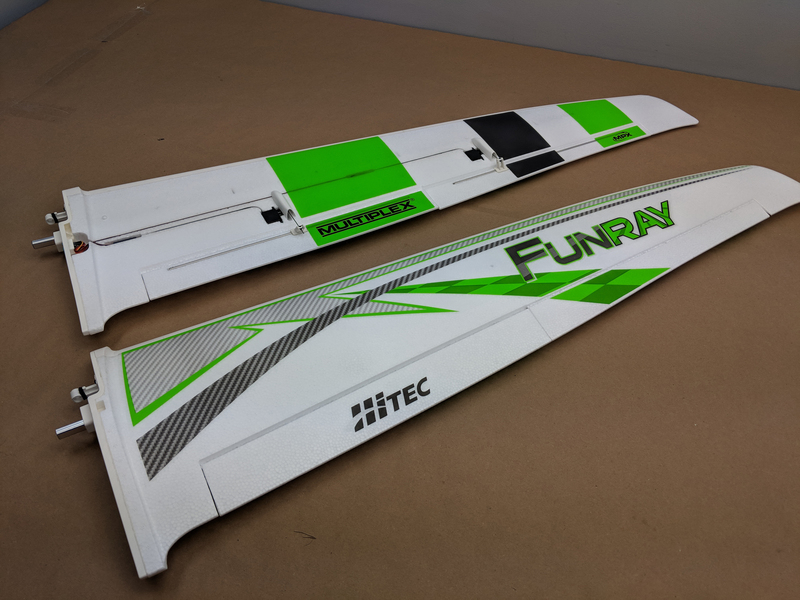 So, without wasting any more time, I’d like to introduce you to the new Multiplex FunRay. 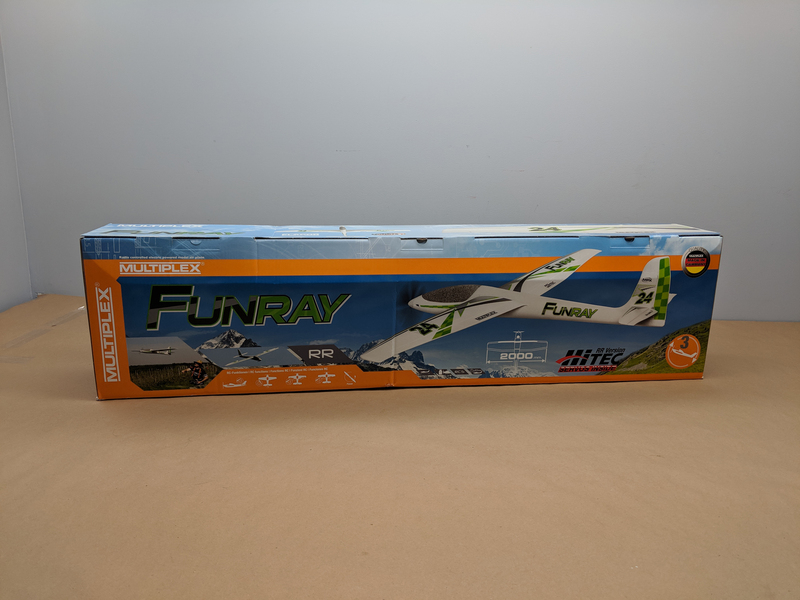 The FunRay is a powered soaring glider with full house control, and it’s a bit of an aerobat as well! 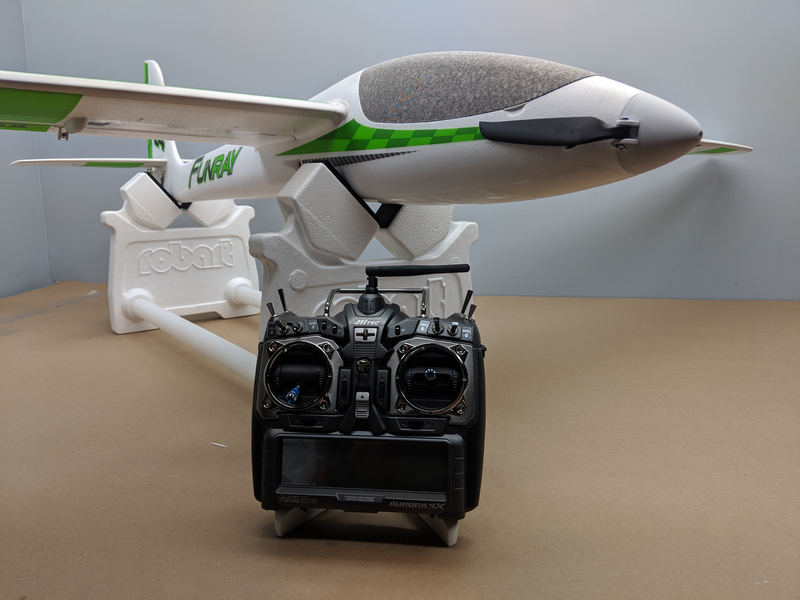 The plane comes in two versions, available as a Kit (just the ELAPOR airframe and hardware) and Receiver Ready. 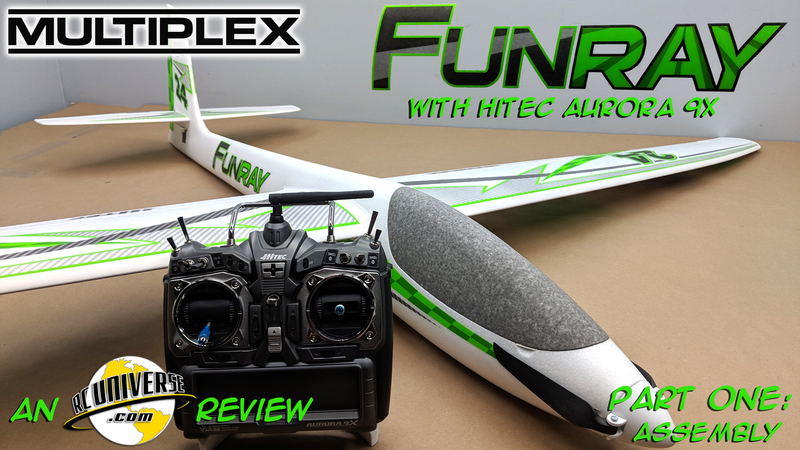 This review will focus on the Receiver Ready version. 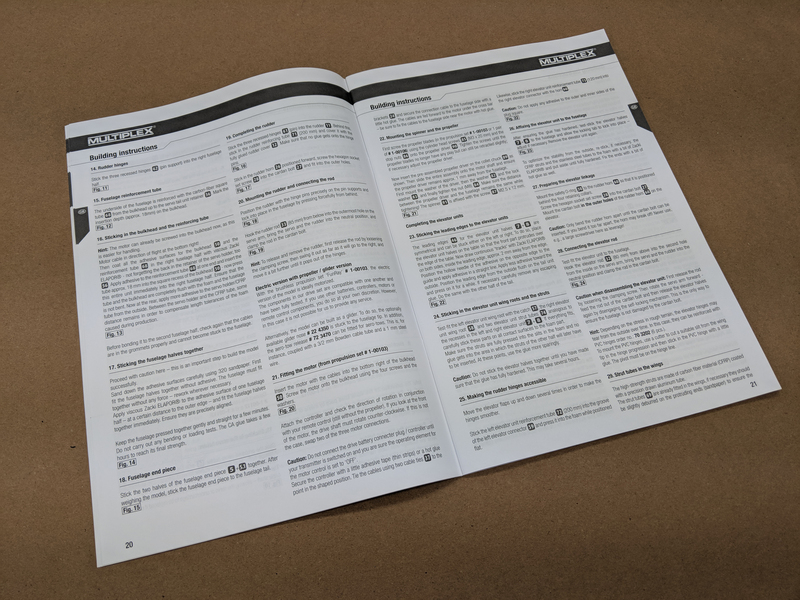 What’s all included in the Receiver Ready? I’m glad you asked! 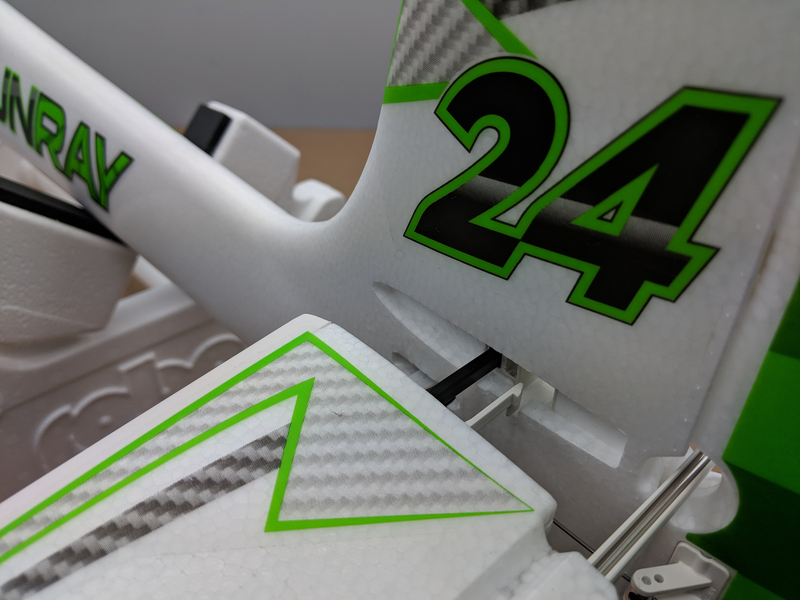 Let’s dig into this new offering from Multiplex (Hitec RCD in the US) and see what’s in the box! 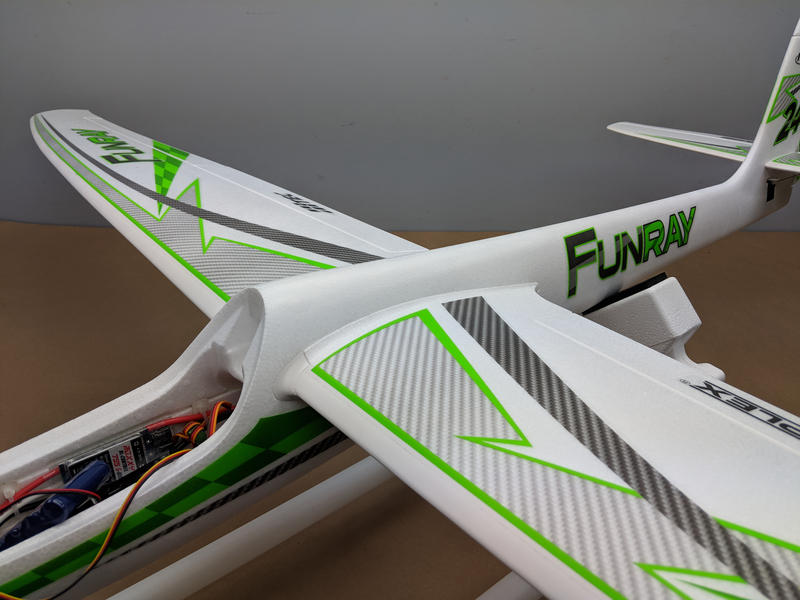 In addition to a 3S 3200 mAh LiPo battery, the Receiver Ready version of the FunRay requires a 5-7 Channel transmitter and receiver. 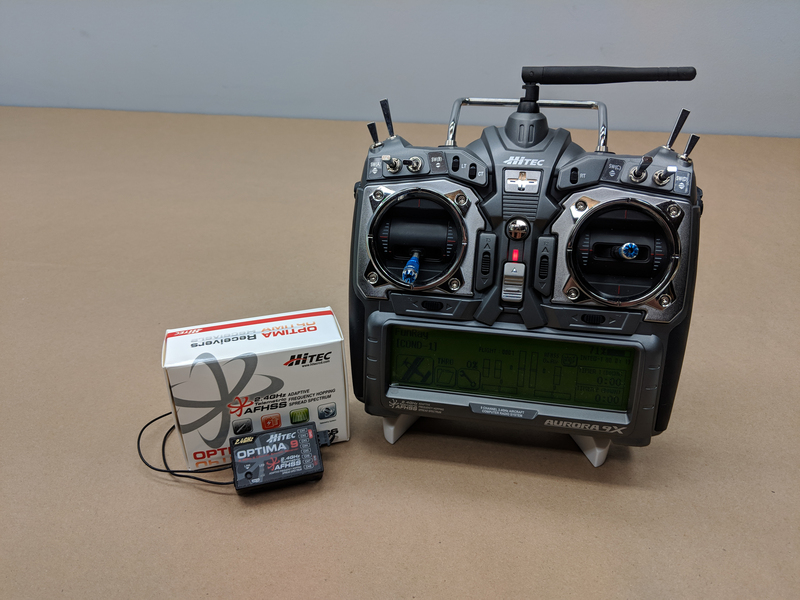 I will be using a Hitec Aurora 9X transmitter and a Hitec Optima 9 receiver. 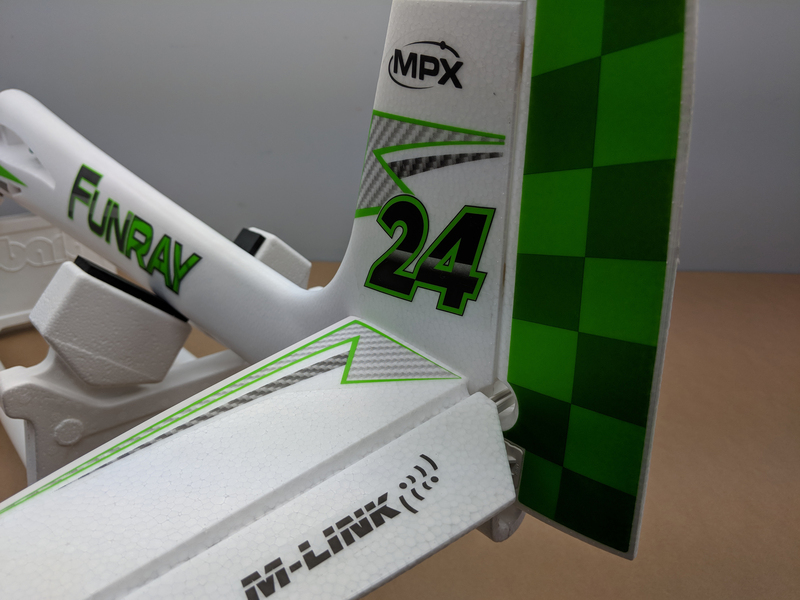 The Multiplex FunRay arrived in a full color box that included really nice photos, helpful information and specifications. 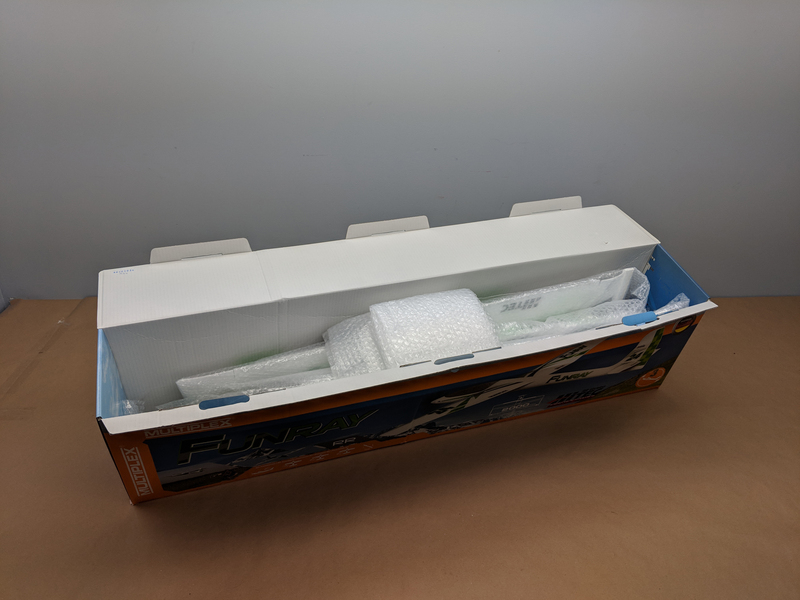 Inside, I found each part individually wrapped in bubble wrap and taped securely. 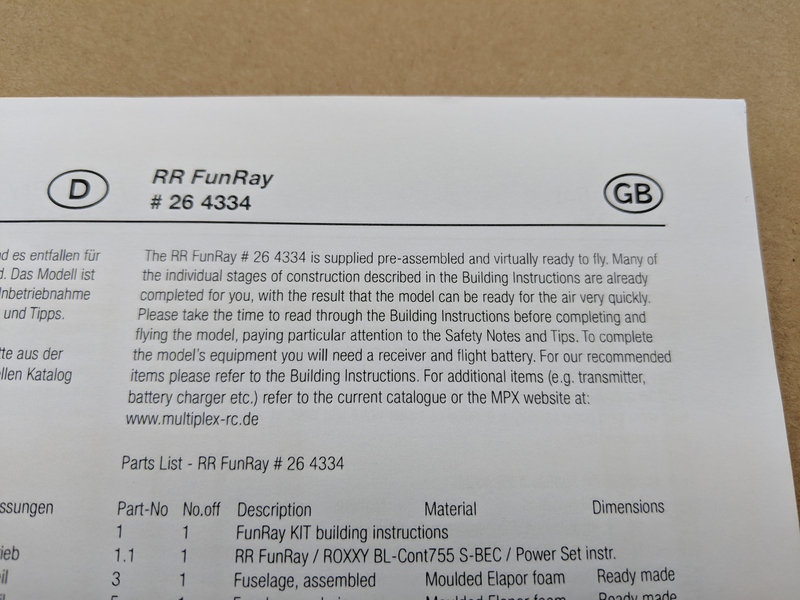 Multiplex did a good job making sure that the FunRay would not be damaged during shipping! 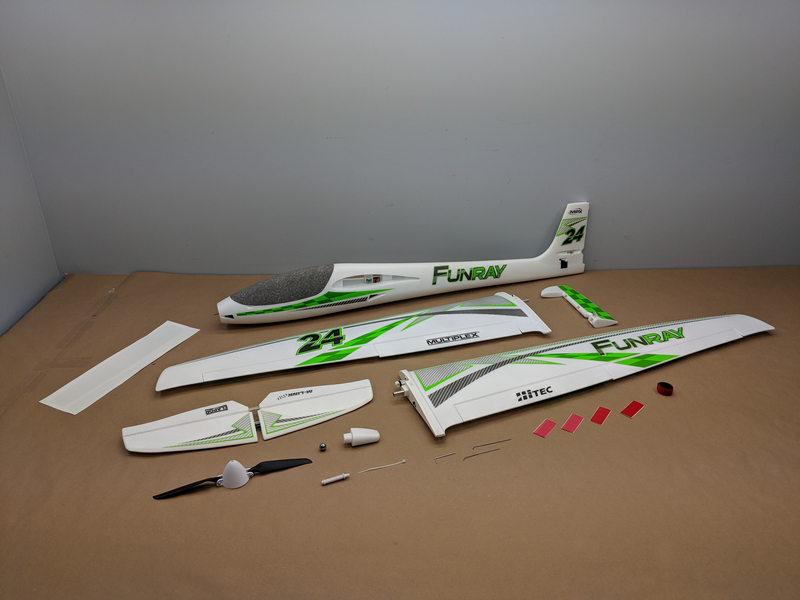 With all of the parts unwrapped, it was easy to see that this would be a pretty quick assembly – all of the decals were pre-installed at the factory, and every part looked great! 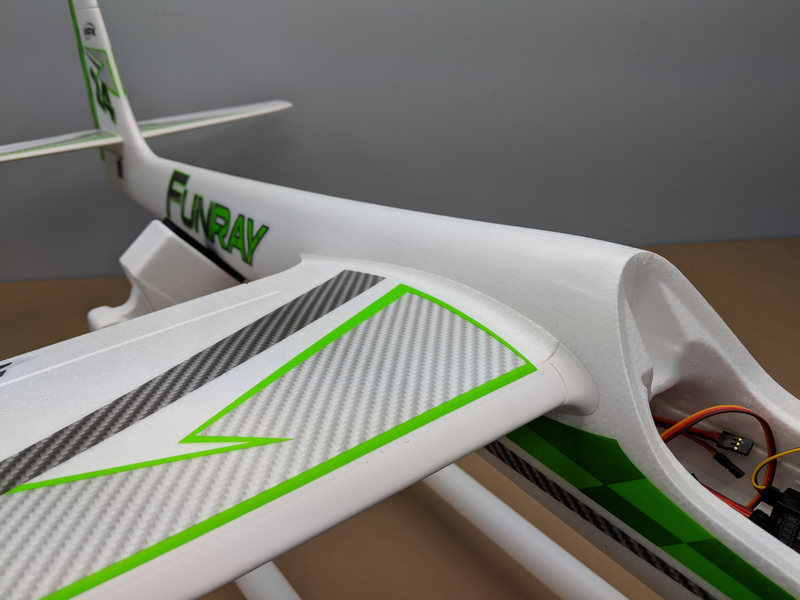 The airframe is made from Multiplex’s ELAPOR foam, and the large canopy/battery hatch has an extra covering material over the ELAPOR to make it more durable. 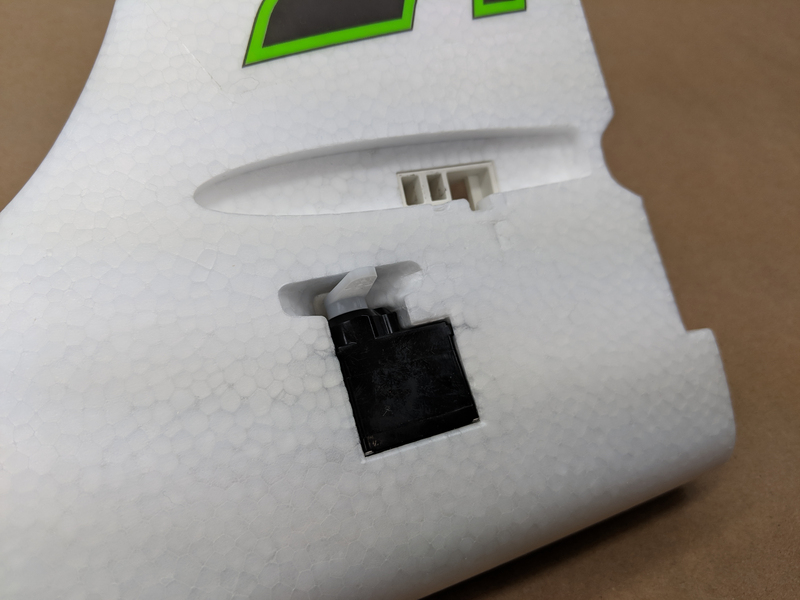 the hatch removal points have a hard plastic piece added to increase the durability. 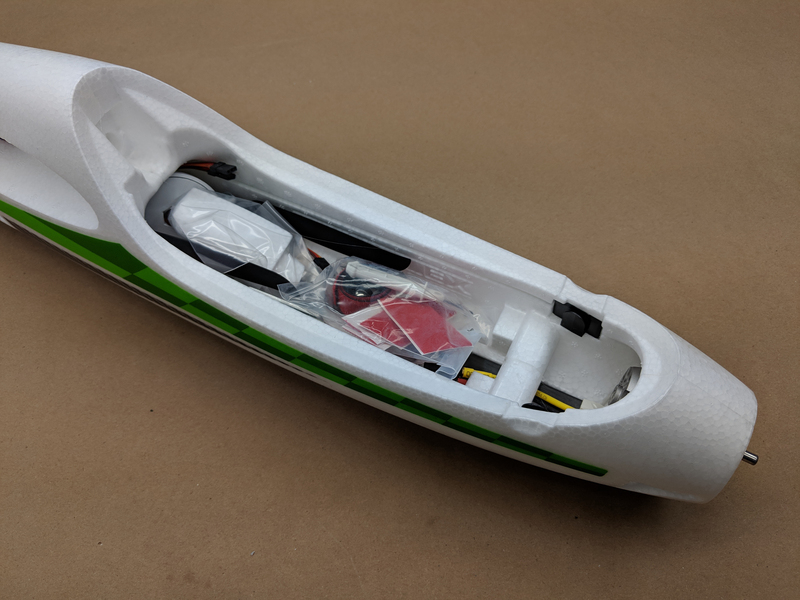 With the hatch removed, I found the hardware bag and prop/spinner assembly. 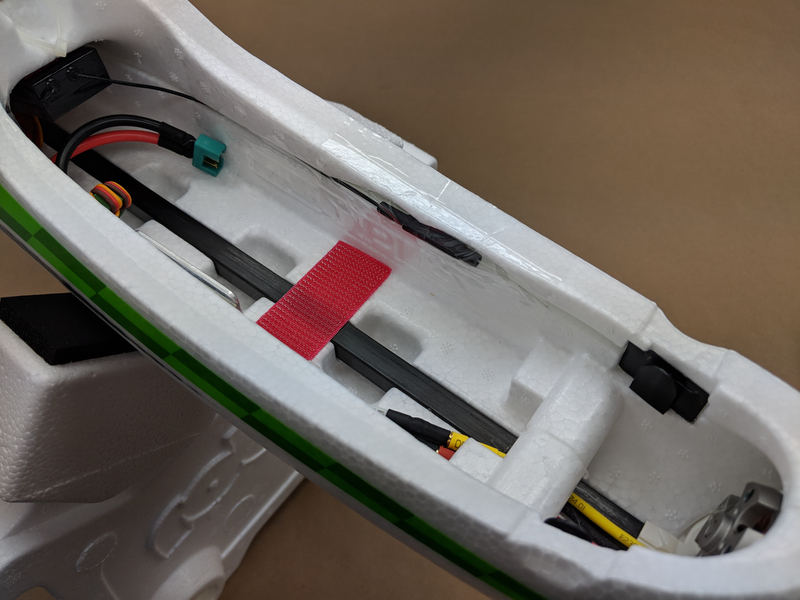 There’s not much in the way of hardware required, but there is a little bit included. 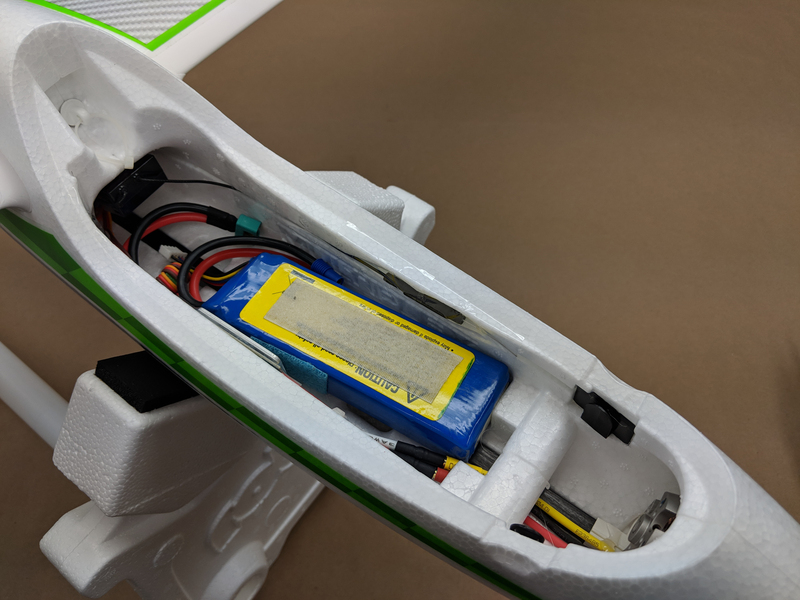 A carbon ‘spine’ is embedded in the lower half of the fuselage to add rigidity to the foam airframe, and you can see the ESC and servo wire connectors are all pre-installed. 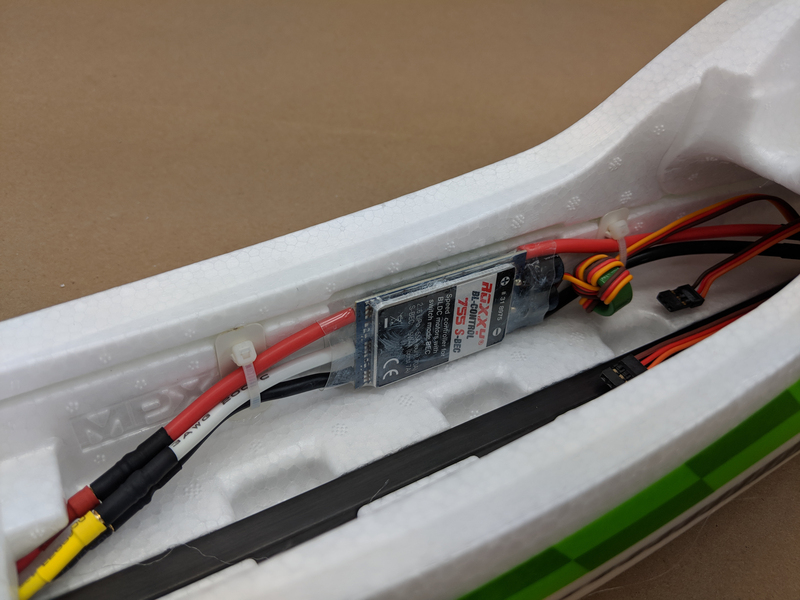 The ROXXY ESC is a 55 Amp (70 Amp Peak) and can handle 2-6S LiPo batteries, and the Installed ROXXY C35-48-990kv Brushless Outrunner Motor looks really nice as well – this setup should provide ample power to pull the FunRay to any height! 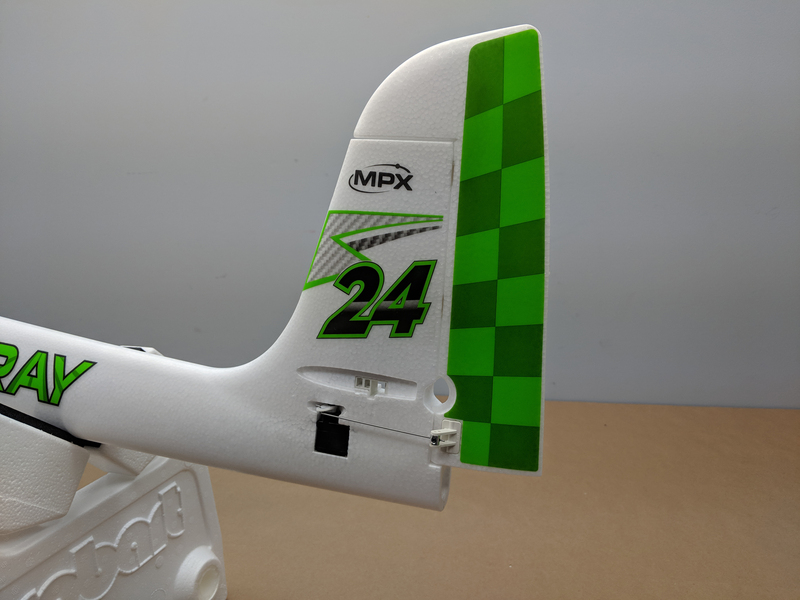 Hitec has provided Multiplex the pre-installed HS-65HB Karbonite Geared servos for the FunRay on all control surfaces. 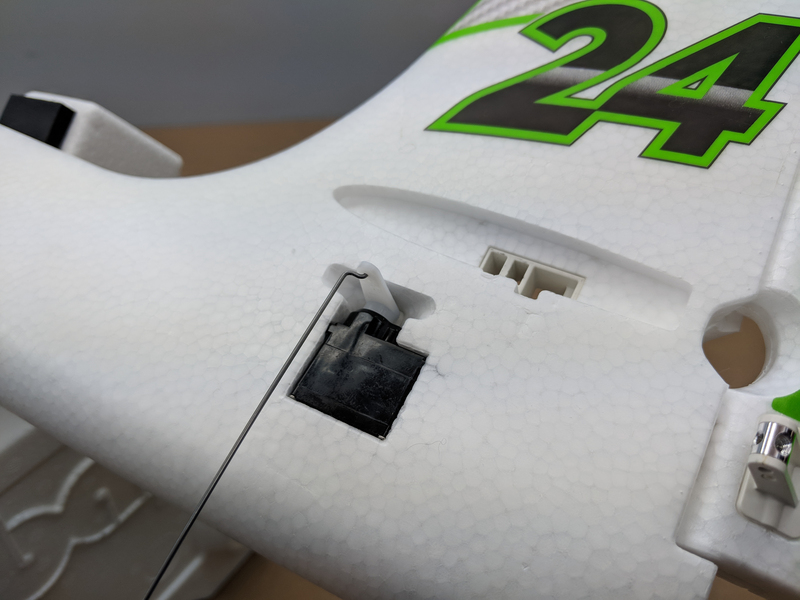 The wires are tucked into grooves in the wings and covered with the decals to keep them secure. 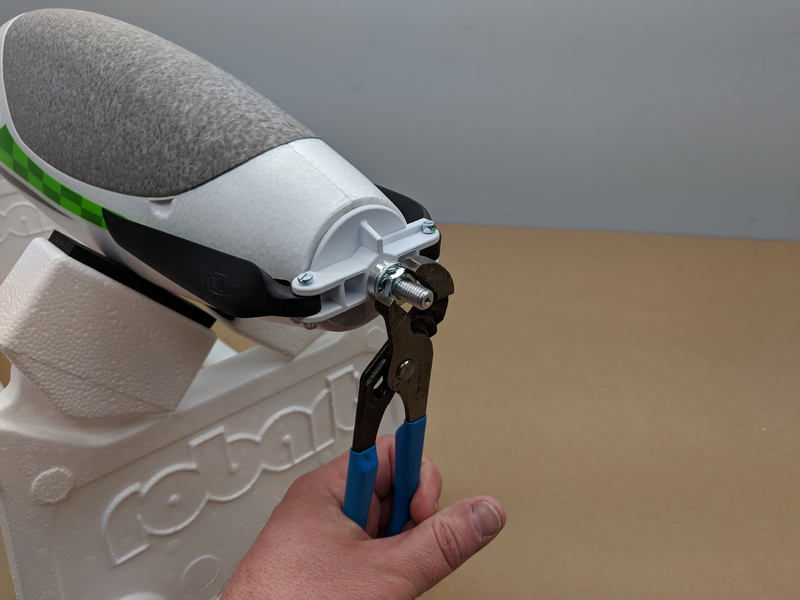 I really like the servo arm/control horn protectors that are also pre-installed to keep the servos safe and provide some drag relief as well! 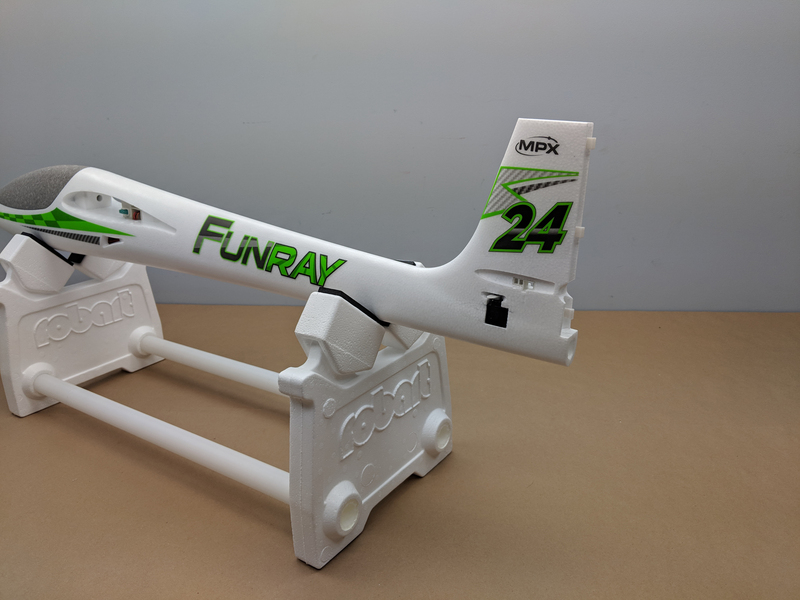 And don’t let me forget one of the neatest features of the FunRay – the wing servo connectors! 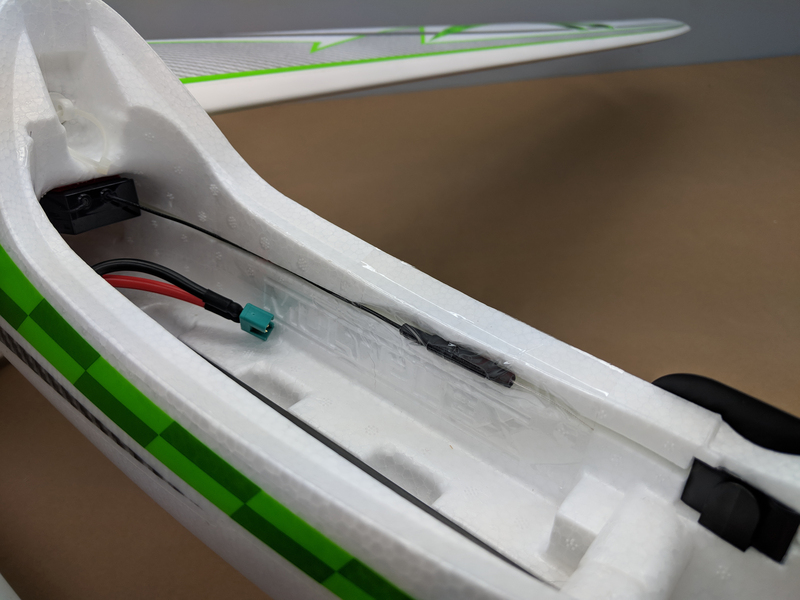 No more fumbling around with connecting servo wires while the wings are partially installed – just slide the wings into the fuselage, and the connector does all the work! 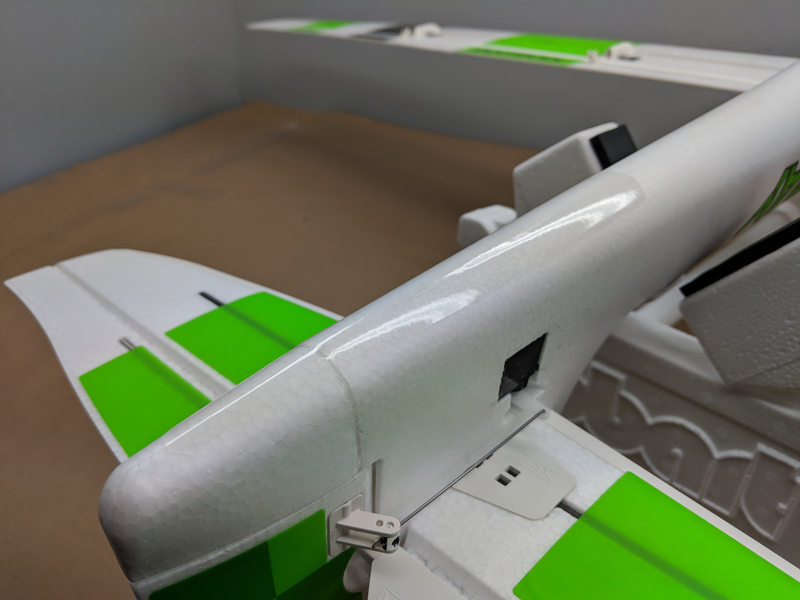 Speaking of sliding the wings into the fuselage, the two-piece wing joiner/stiffeners slide together into a composite housing. 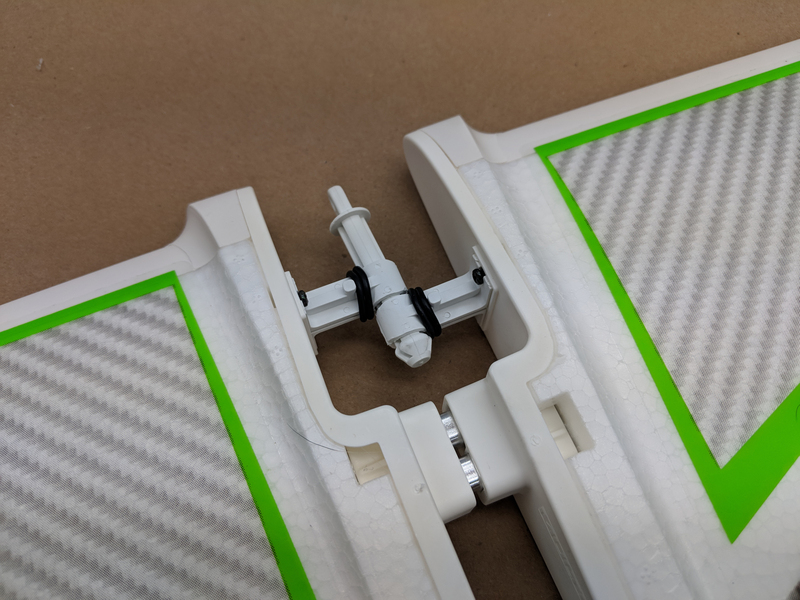 Like the joiner, the retainer clips slide together, and a pin is installed through the canopy area to lock the wings to the fuselage. I really like the simplicity of this system! 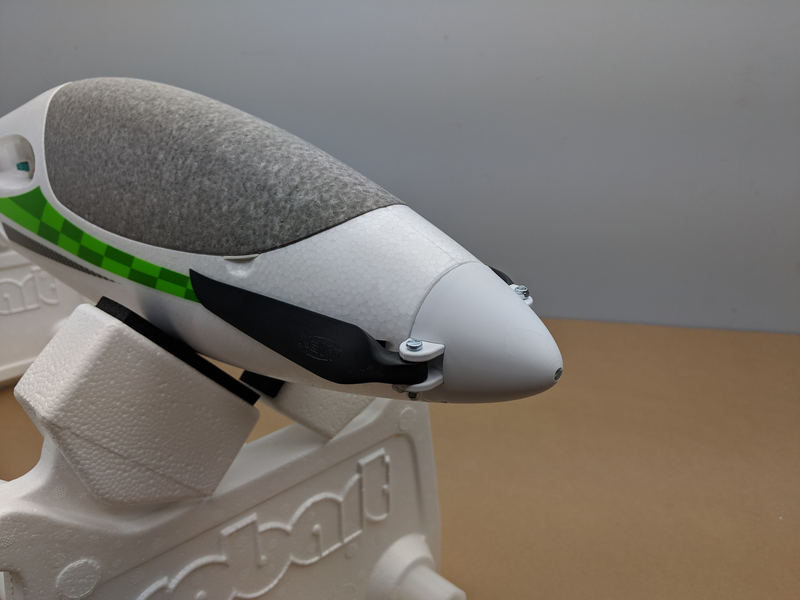 The tail servos are pre-installed in the fuselage, leaving very little for the modeler to complete. 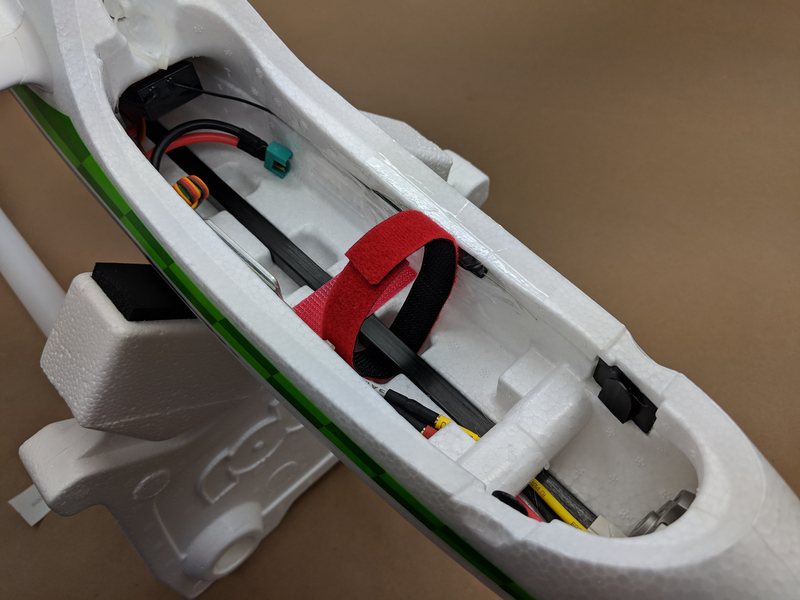 All that protrudes from the fuse is the servo arm, leaving a clean airflow design. 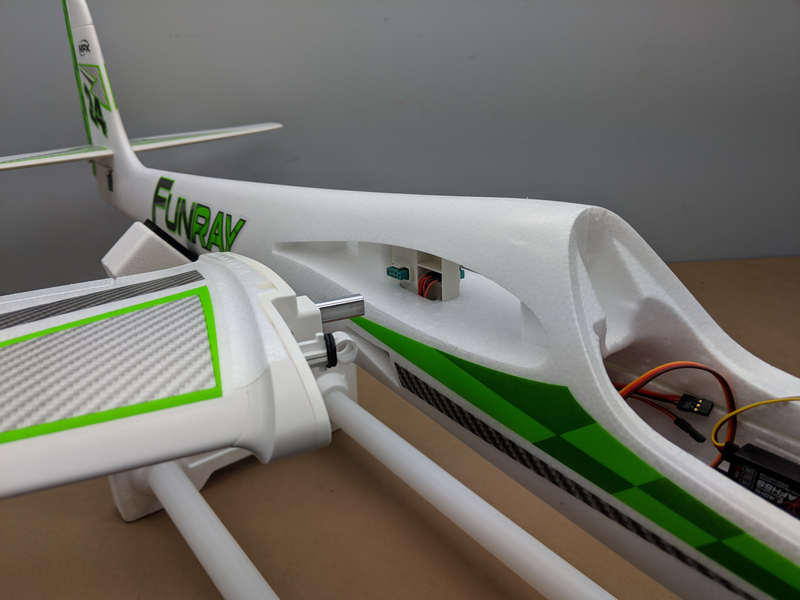 The rudder hinges are composite, and require that the rudder is snapped into place, and the two-piece horizontal Stabilizer/elevator system is made to be disassembled for easy, safe transport. Remember that hardware bag I mentioned earlier? 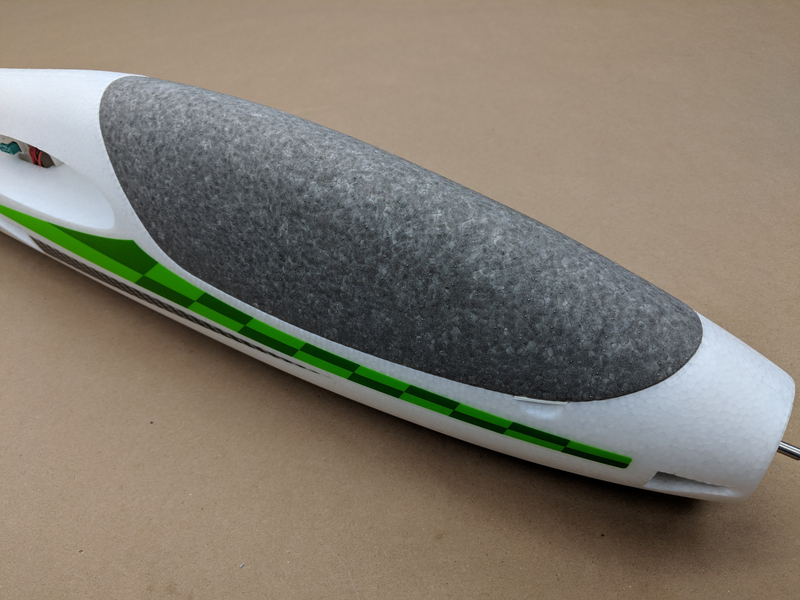 Well, this is what’s in it – a couple pieces of Velcro, two pushrods, a hex-key , and a ballast ball and foam tail piece. Yep, that’s it! 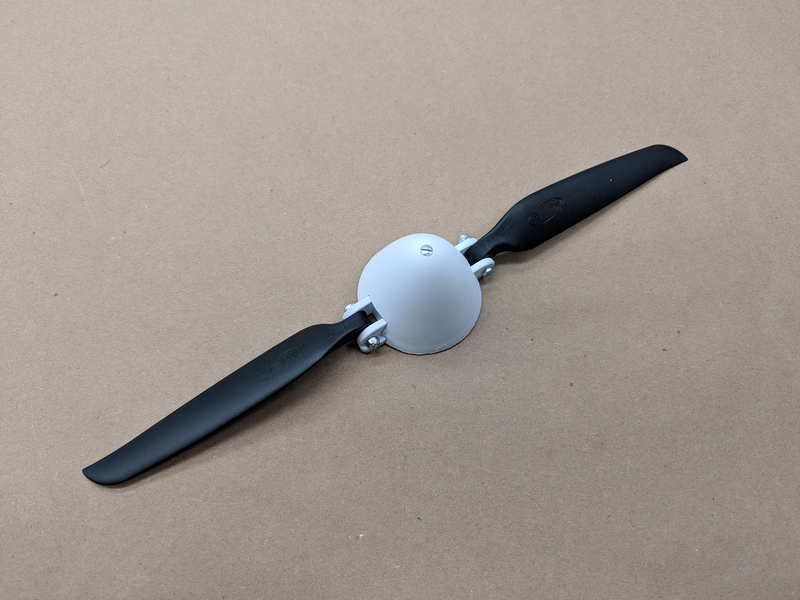 The folding propeller/spinner is pre-assembled, but the spinner will be removed for installation. 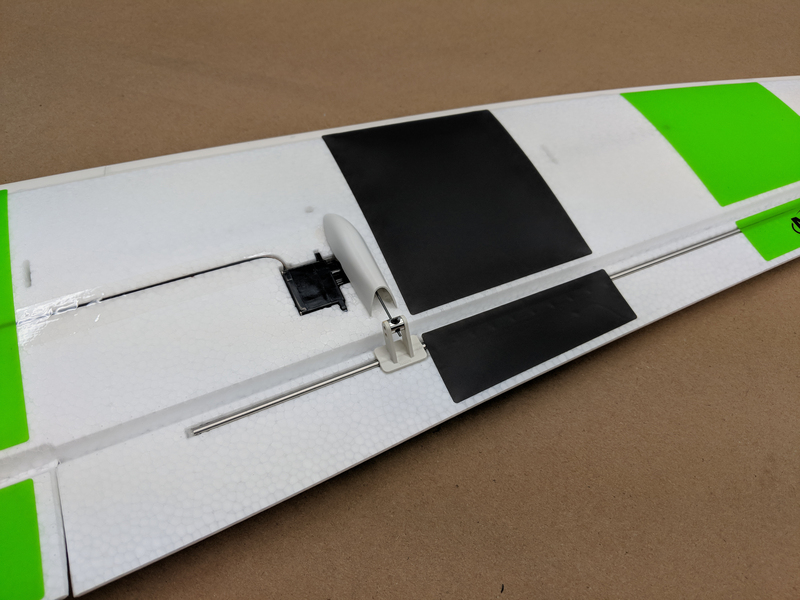 There is also a sheet of ‘decals’ included with the FunRay – These skid sprotectors are applied to the bottom of the fuselage at the nose and tail, and protect the fuselage from damage on landing. 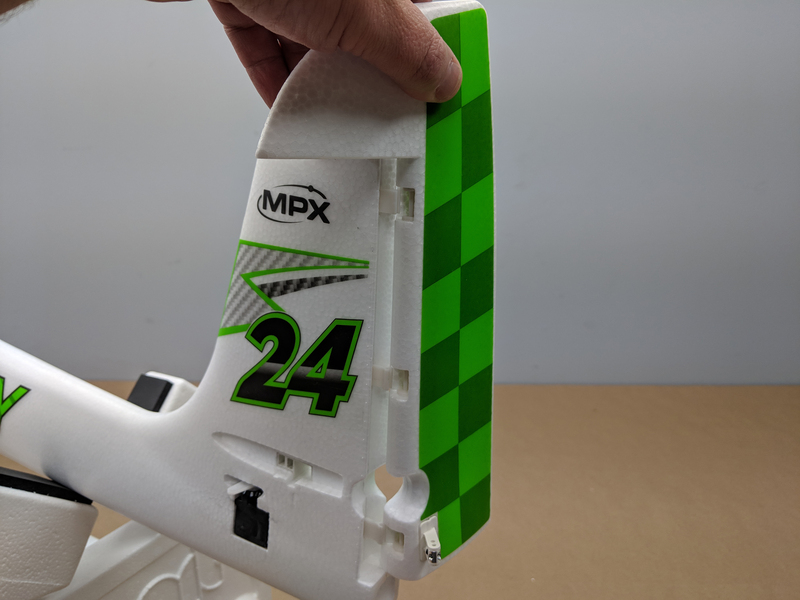 They are really thick, and should provide good protection! 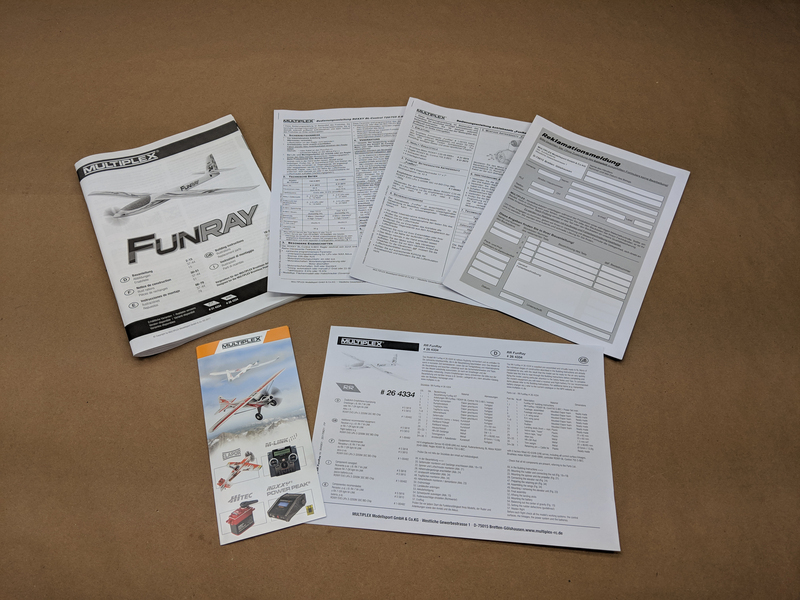 The Multi-language manuals included cover both the kit version and the Receiver Ready airplane, so a lot of the manual isn’t required for the RR version. 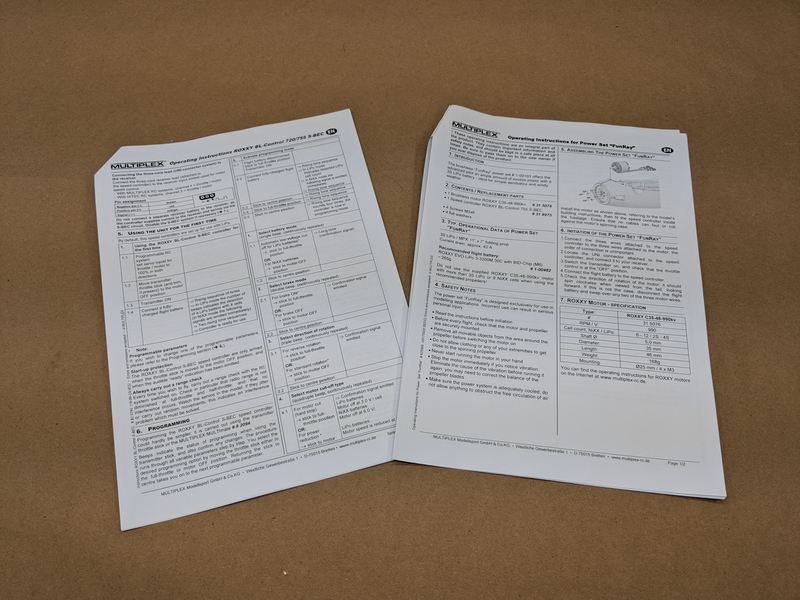 There is a separate manual included for the ESC, as well as a brochure for all of Multiplex’s other aircraft and a parts list too! 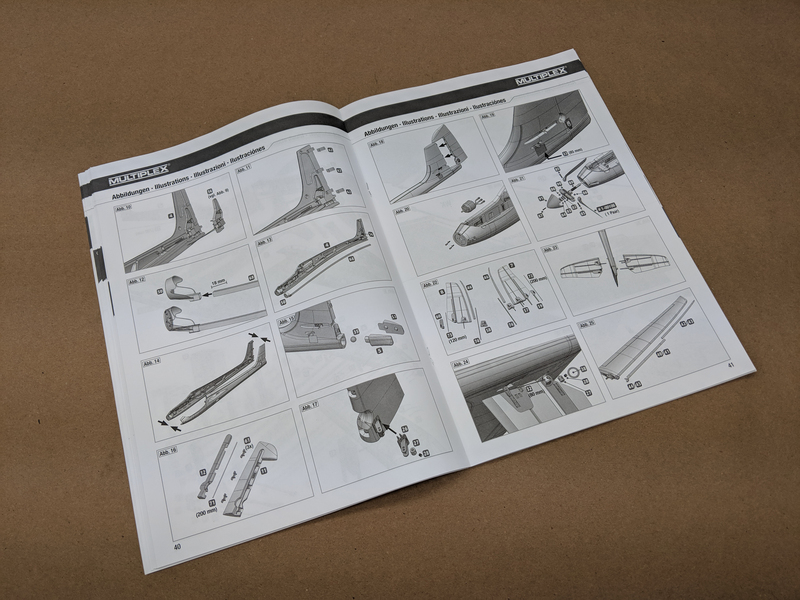 The manual does a great job of helping the modeler put together either version of the FunRay. 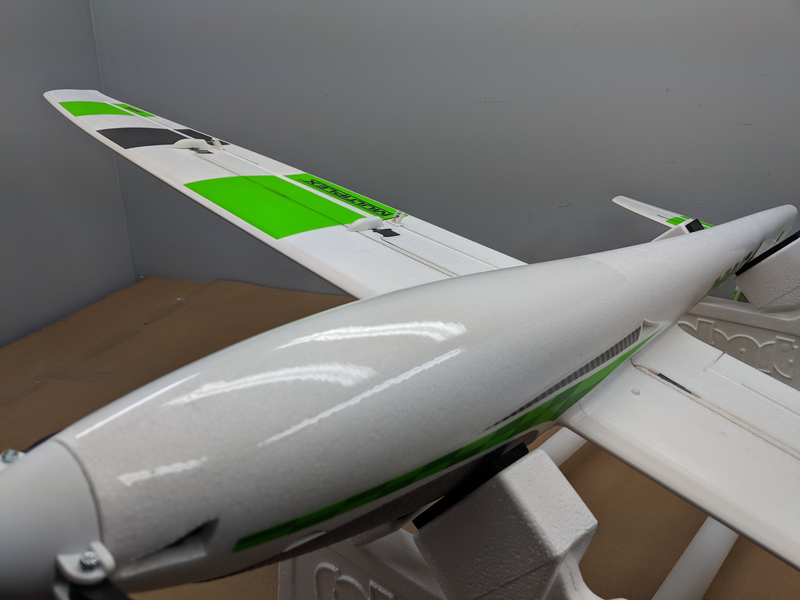 Assembly began with attaching the rudder to the vertical stabilizer. 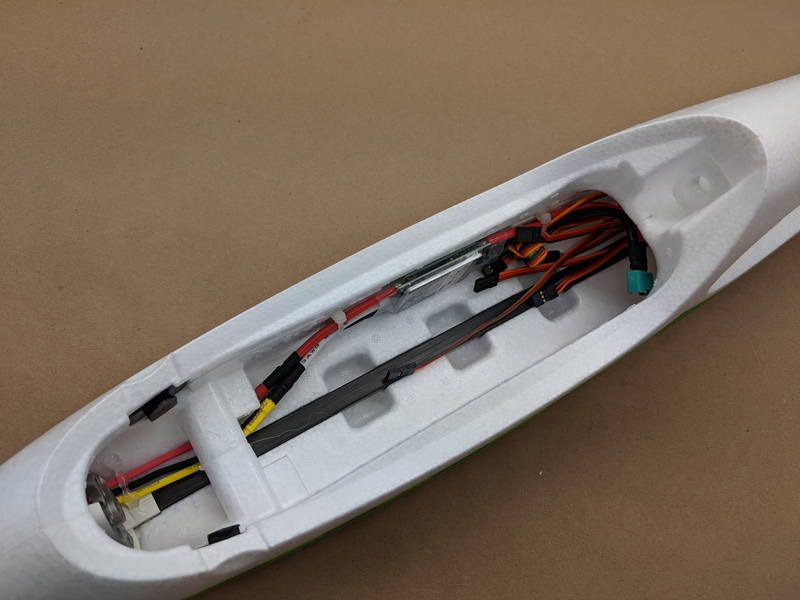 The two-piece hinges, which are pre-installed in the fin and rudder simply snapped together to make a slop free, connection. 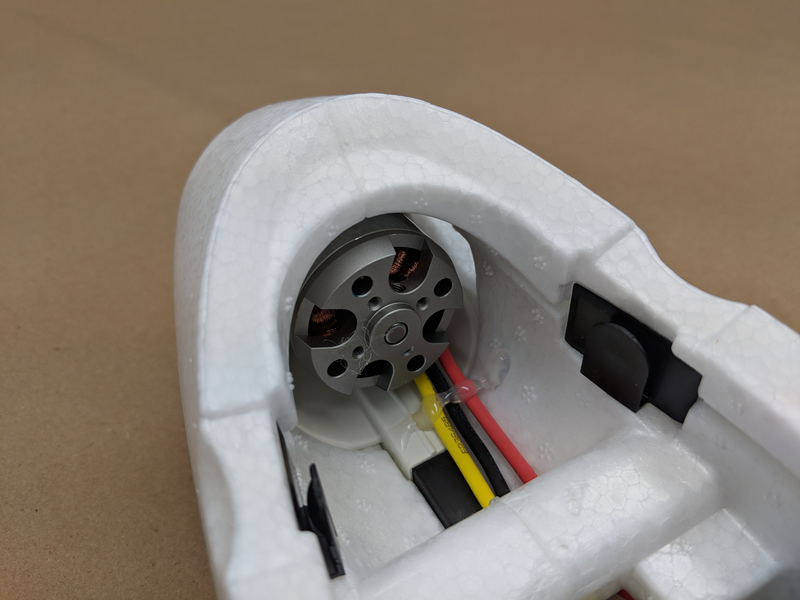 The Rudder pushrod was inserted into the outermost servo arm hole and into the cardan bolt (control horn clevis). 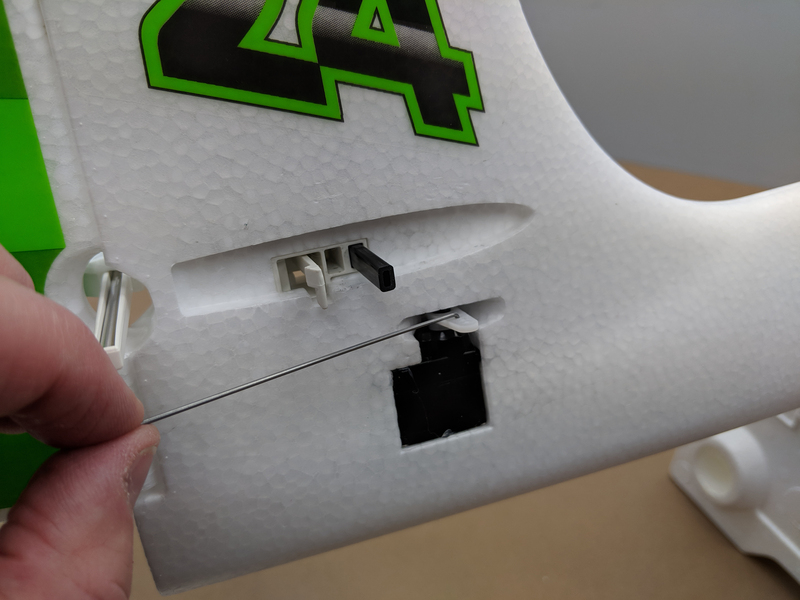 With the servo and rudder centered, the set screw in the cardan bolt was tightened, but not before I added a drop of ZAP Z-42 Blue Thread Locking Compound to the set screw. 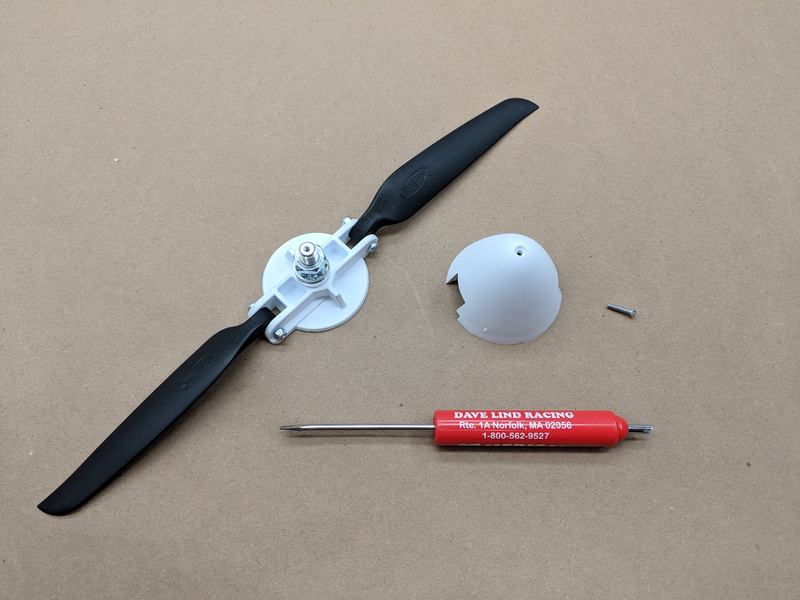 I removed the spinner cone, slid the propeller adapter onto the motor shaft, and tightened the propeller nut. 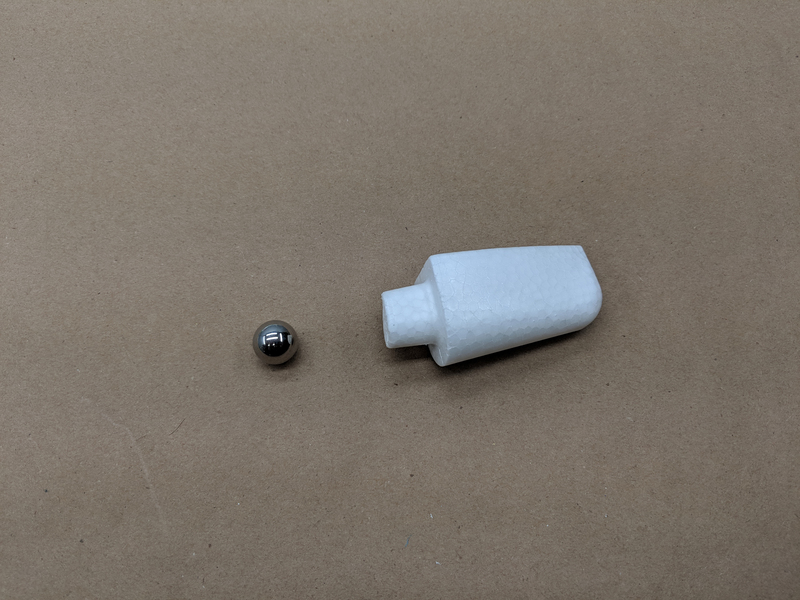 The spinner cone was then installed and secured with a single screw. 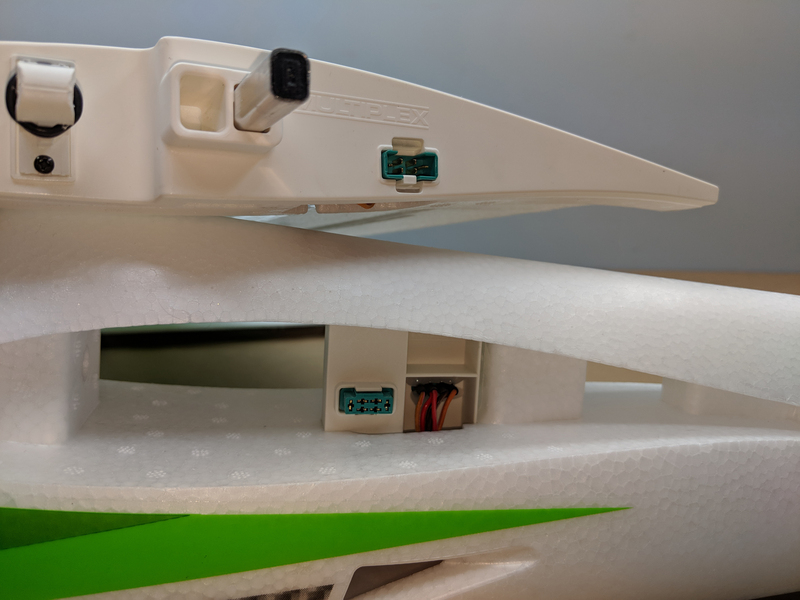 The left side of the two-piece horizontal stabilizer/elevator assembly was slid into its mount, and pressed tightly against the fuselage, before installing the elevator pushrod into the third hole from the end of the servo arm. 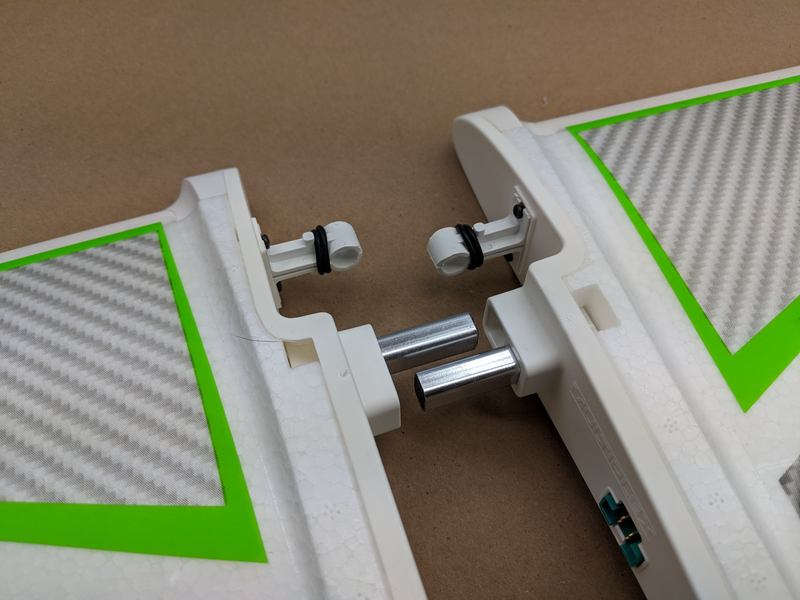 The right side stab/elevator was installed and snapped into place, and the elevator pushrod was secured to the cardan bolt. 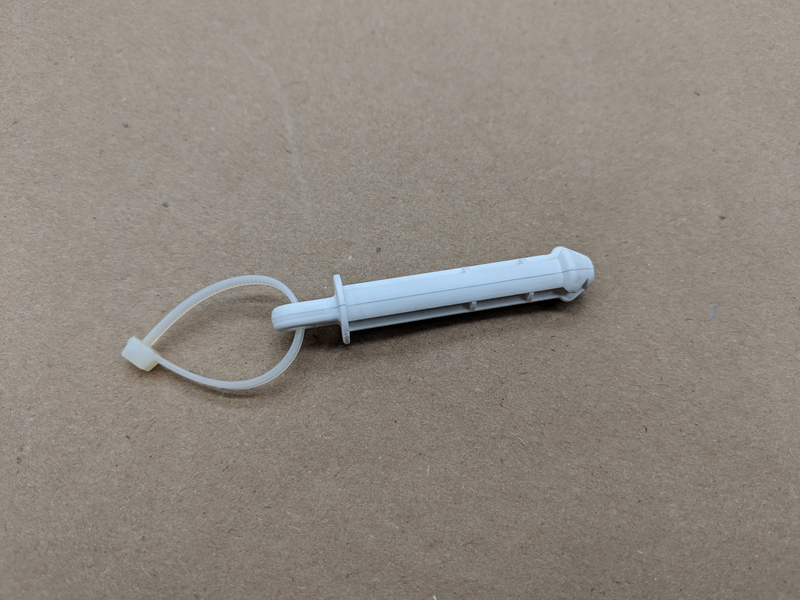 A drop of ZAP Z-42 blue thread locker was again used on the set screw. 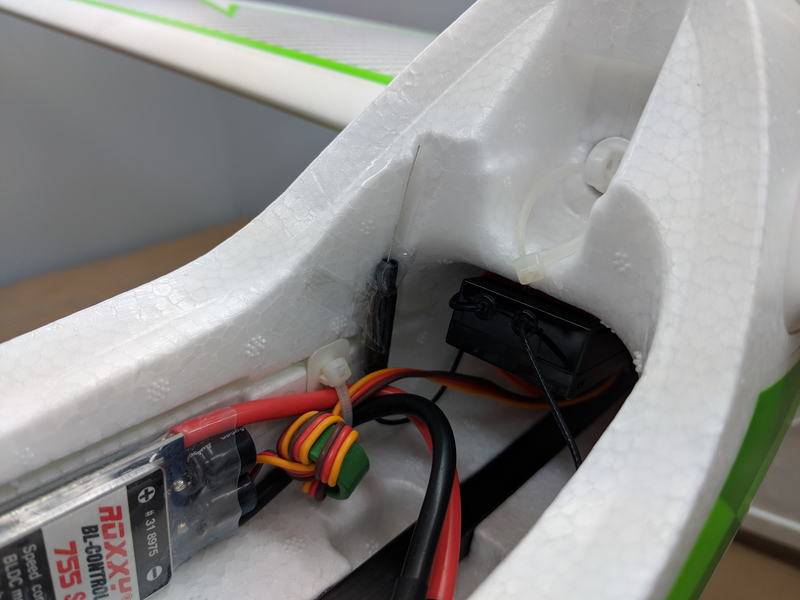 I secured the included Zip Tie to the wing locking pin, and added a drop of ZAP-A-GAP Medium CA+ to the connector to keep the Zip Tie from coming loose. 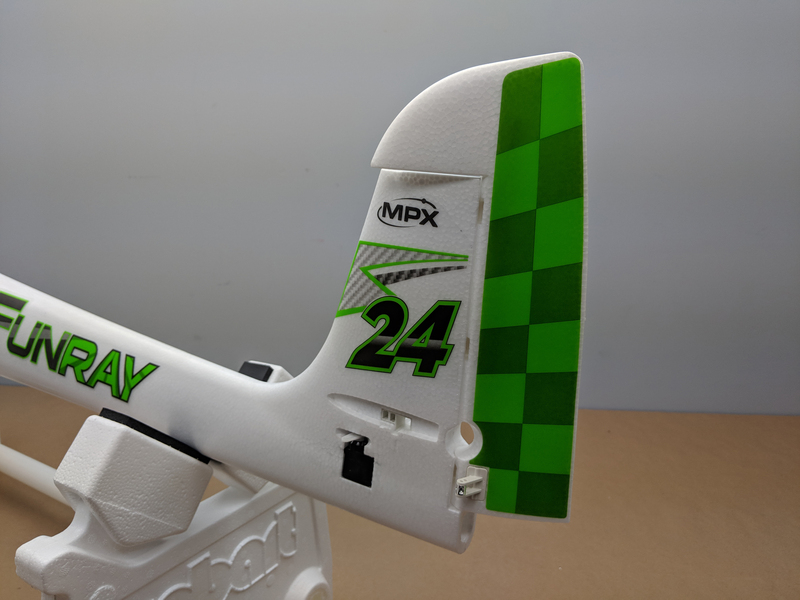 The right wing half was slid into place and pushed tightly into the wing mounting saddle. 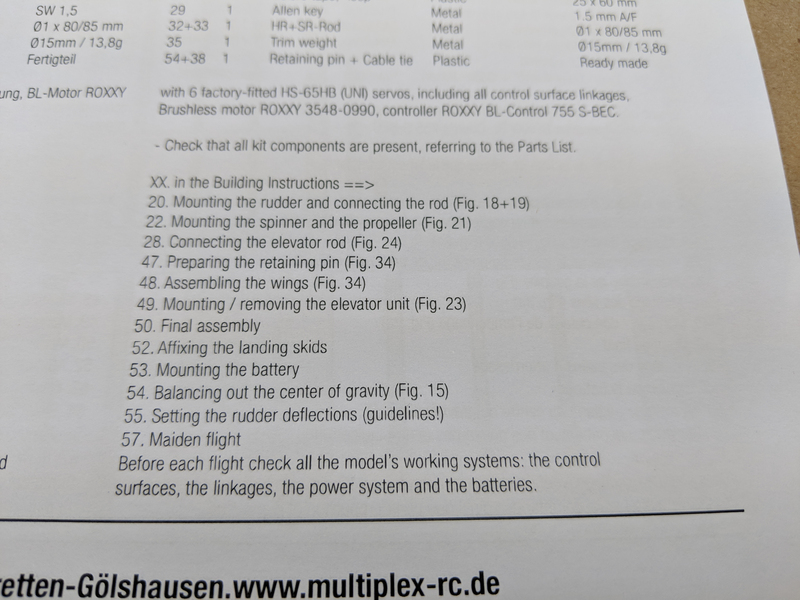 The best part of this is that there are no wiring connections that the modeler has to touch. 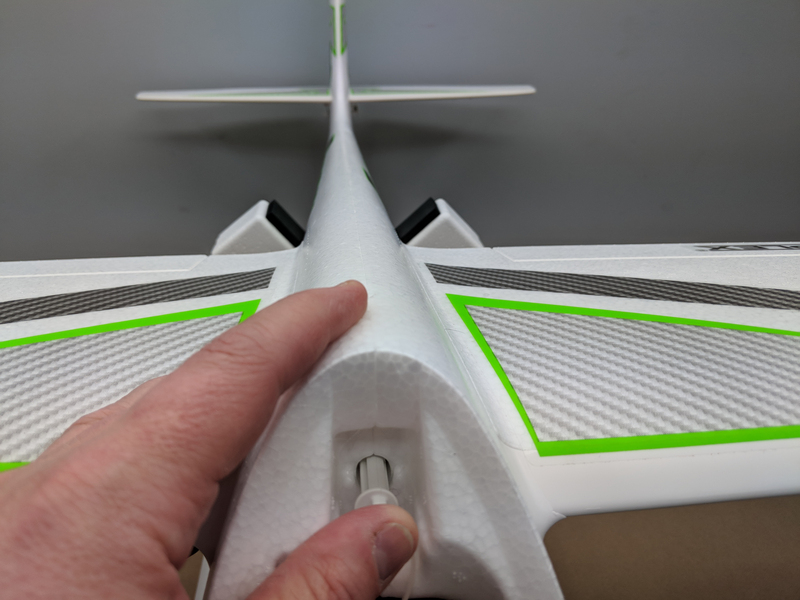 They are all pre-installed, and connect automatically as the wing slides into place! 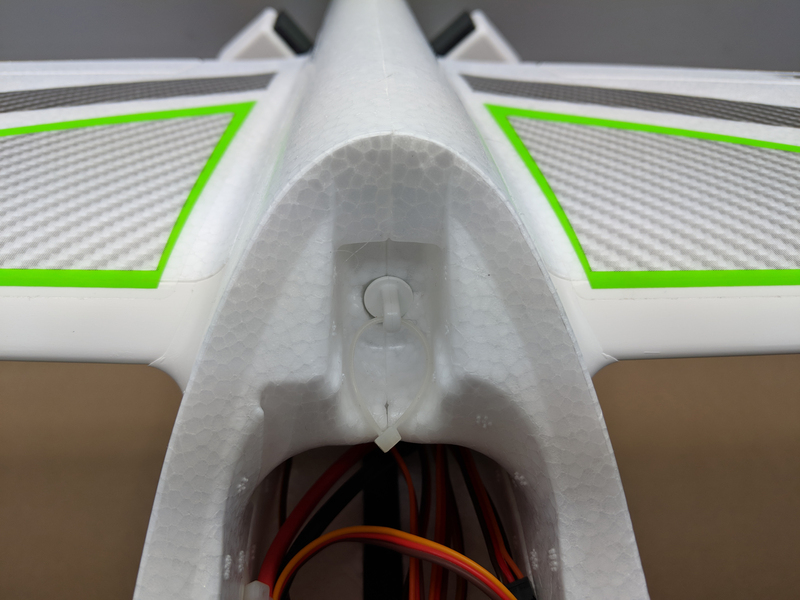 In the last photo, you can see the aluminum wing spar sticking through into the open space in the fuselage. 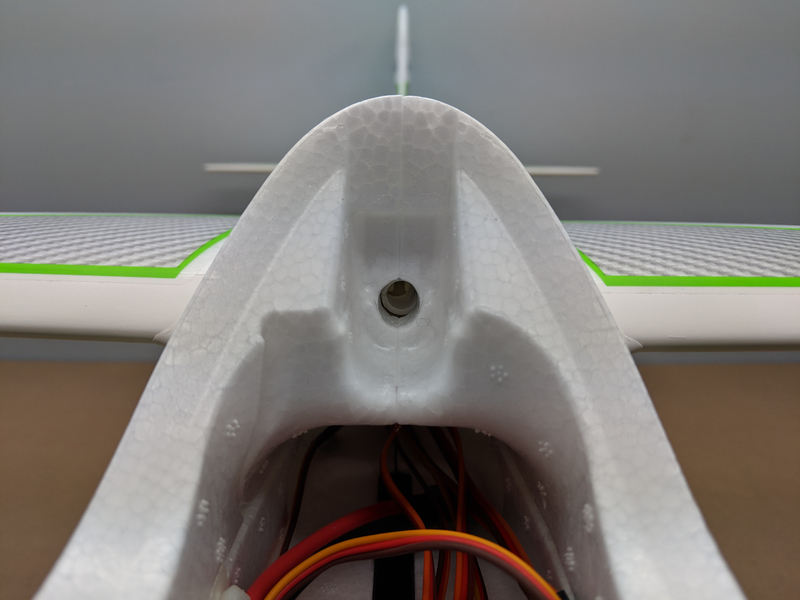 The hole in front of the spar will accept the spar from the left wing as it slides into place. 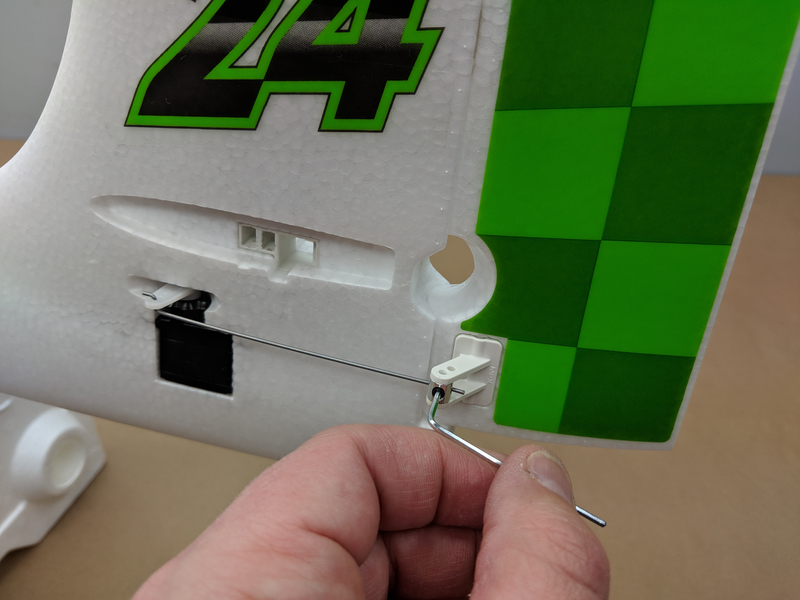 With the left wing installed, the locking pin was inserted into the hole in the canopy area. 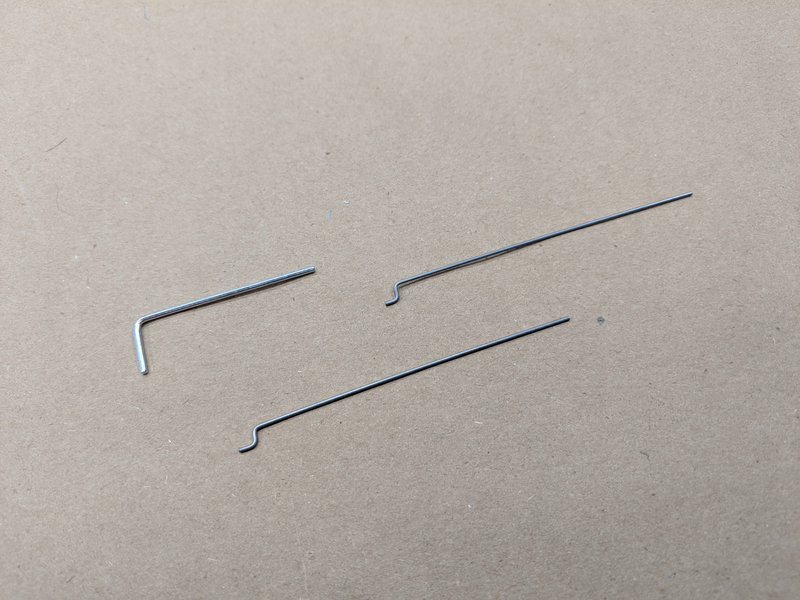 Once the locking pin was inserted, it looked like this. 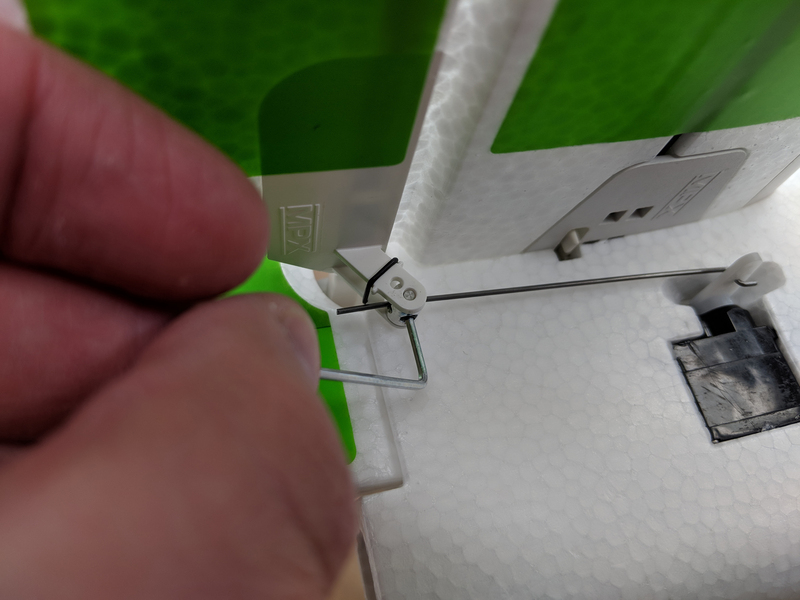 The Zip Tie allows the modeler a pulling ring to remove the locking pin easily. 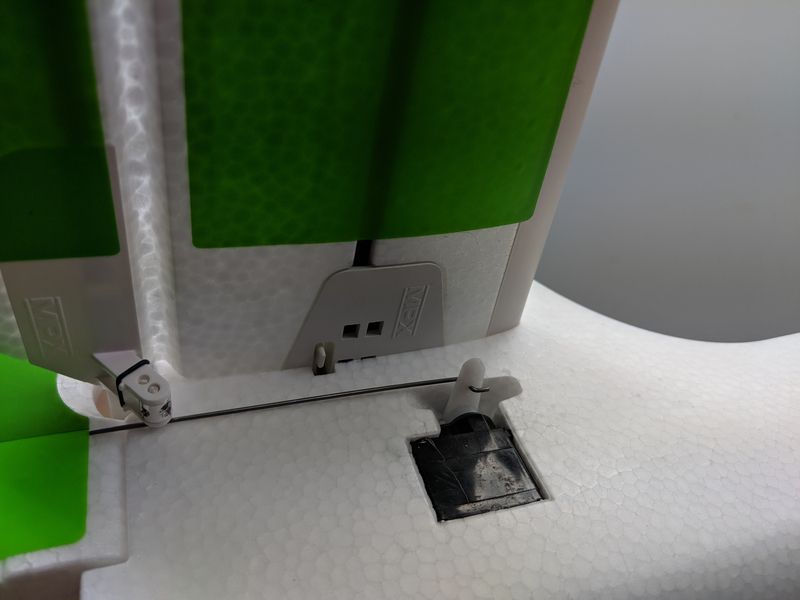 The canopy also provides a secure lock for the pin once installed. 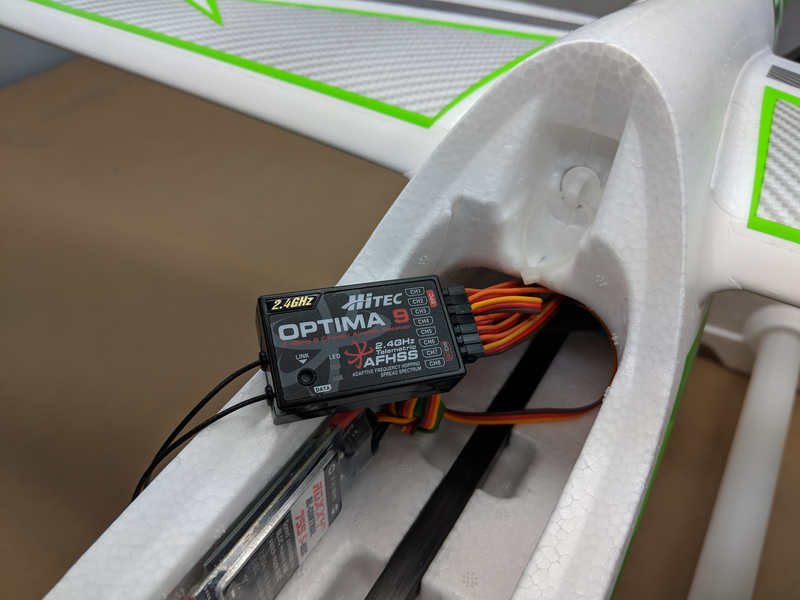 The Hitec Optima 9 receiver was connected to each of the servo wires, and installed in the top section of the fuselage. 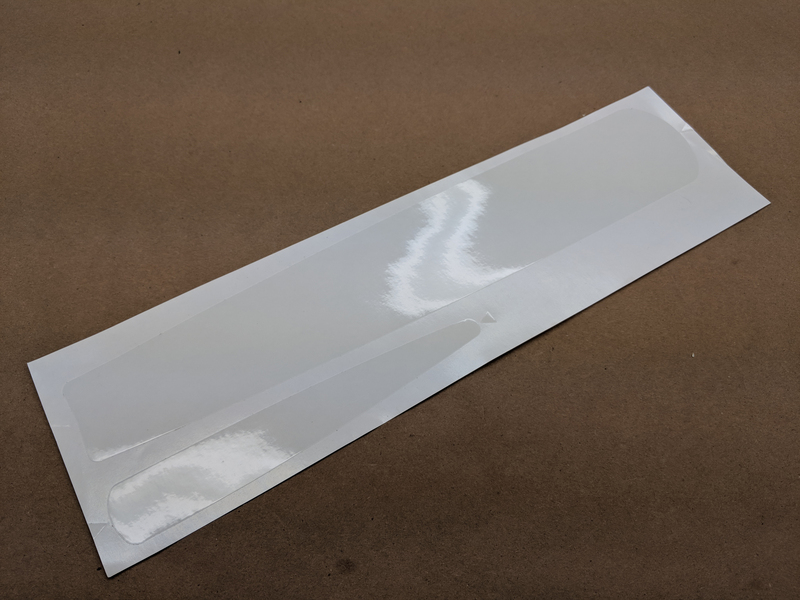 The antennas were positioned at 90° to one another and secured with clear tape. 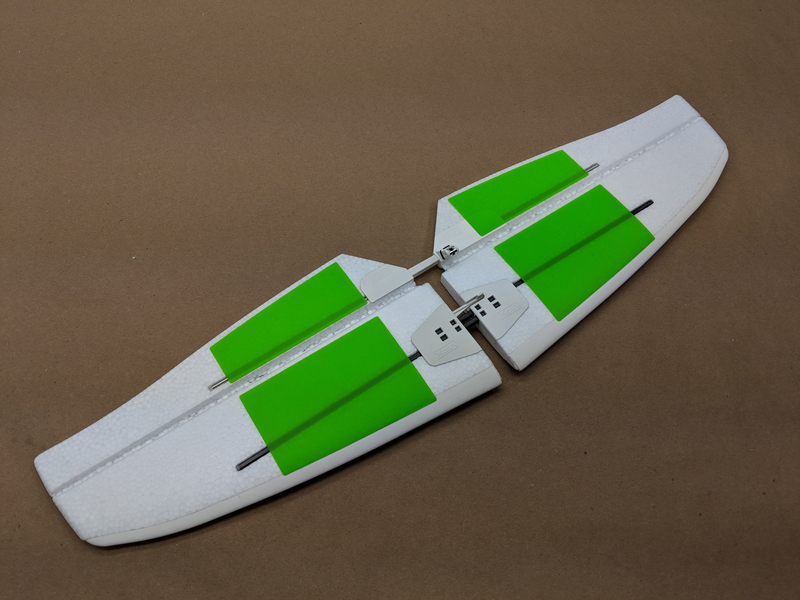 The 3S 3200 mAh LiPo battery was temporarily installed to find the proper Center of Gravity (75 mm from the leading edge of the wing at the fuselage with the plane in the upright position), I decided that I didn’t need to add the steel ‘Ballast Ball’ in the tail of the FunRay. 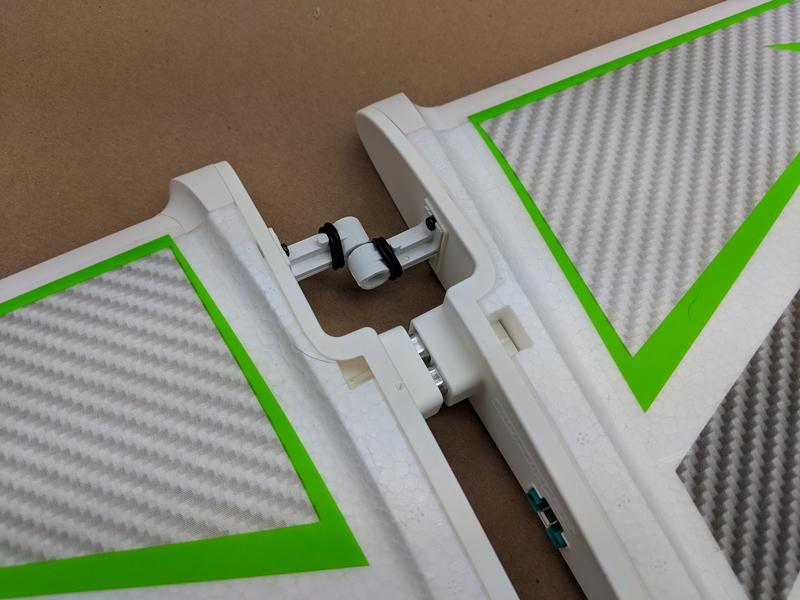 The small foam tail section was glued in place using ZAP-A-GAP Medium CA+ and a quick shot of ZIP Kicker. 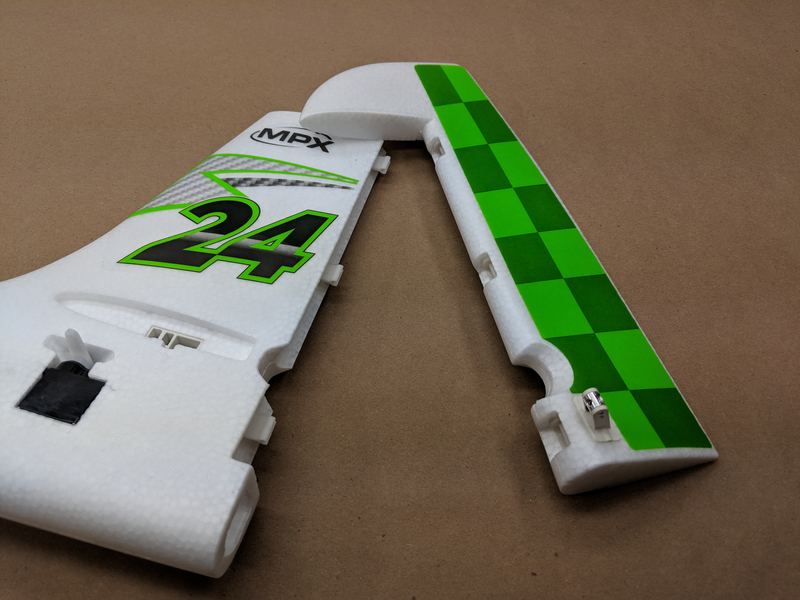 With the tail section glued in place, the skid protection decals were applied and worked to shape. 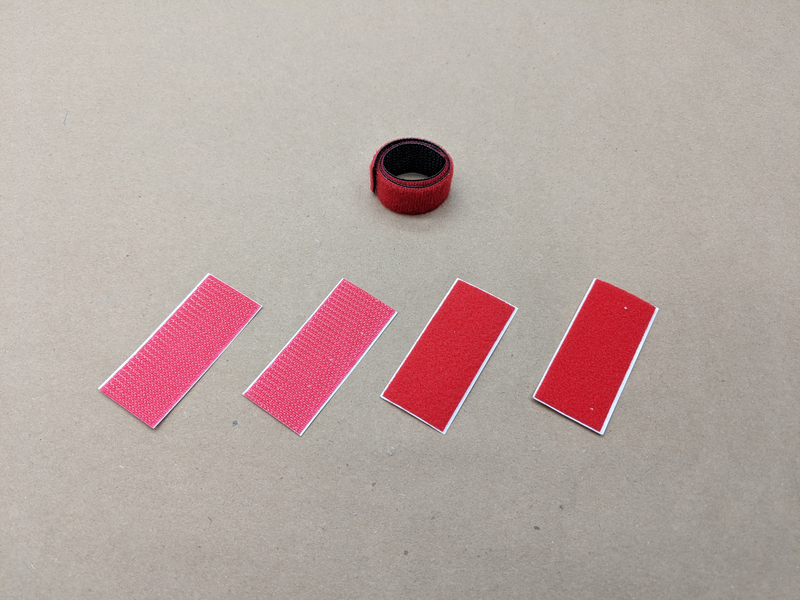 Reviewer’s Note – The skid protection decals will take some work to get in place and stick properly, but once applied, they’re stuck!